Brian Muir, the legendary artist who sculpted the original Darth Vader helmet based on Ralph McQuarrie’s designs, recently announced on Twitter that he began work on Star Wars: Rogue One. It’s a fair assumption that, since Rogue One tells the tale of a group of Rebels on a quest to retrieve the plans for Death Star I, Muir will be sculpting new armor for classic Stormtroopers, new characters, and perhaps an updated version of the Dark Lord of the Sith himself. The evolution of Darth Vader from whiny teenager to most feared man in the galaxy left fans flat, but visual development of the character documented by Michael Kaminski at his Secret History Of Star Wars site is an interesting read. Darth Vader became an iconic silver screen villain the moment his pitch-black silhouette first appeared against the stark white background of Princess Leia’s Tantive IV. Even after Vader turned face and dropped the Emperor down the shaft of Death Star II, his reputation as a bad guy preceded him. Even before it was revealed that Anakin Skywalker cut down a classroom full of younglings, America’s other favorite child murderer, Freddy Krueger, was called “the most popular cinematic maniac since Darth Vader” by Newsweek. 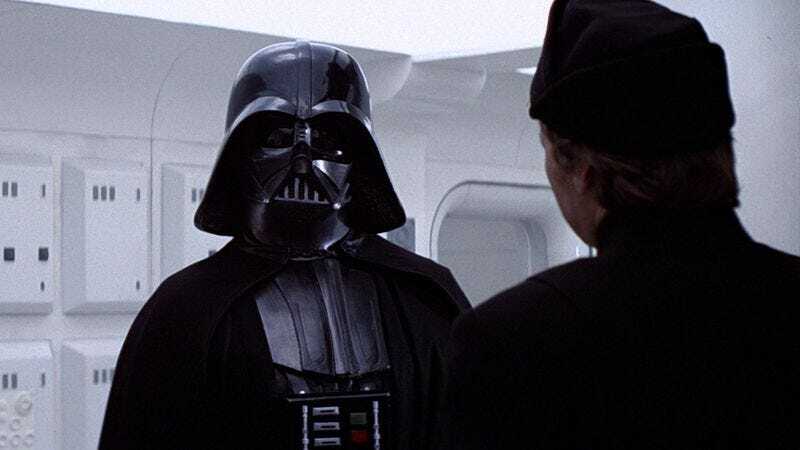 Kaminski’s piece details the evolution of Darth Vader from his humble beginnings as an Imperial General in early drafts of The Star Wars to his final cinematic appearance. Of course, the respirator became more than a spacesuit necessary for breathing in a vacuum and became a distinguishing characteristic of Vader, with the villain wearing the space suit throughout the film by the fourth draft. While it certainly retained the mystery of the character, it did rob audiences of the concept of Vader drinking “casually from a flask” similair to a Nazi villain in a World War II film. According to Kaminski’s piece, Vader became more and more influenced by The Lightning from the 1930’s Devil Dogs serial and Doctor Doom. The design that finally made it to the screen in 1977’s Star Wars, as sculpted by Brian Muir, was asymmetrical, with a red tint to the eyes. According to Dressing A Galaxy: The Costumes Of Star Wars, the costume was mocked up from a World War II German stahlhelm gas mask, a monk’s cloak, a leather under-suit, and a metal breastplate. This kind of hodgepodge look combined with the grit and grime present on the helmet was part of the lived-in universe that George Lucas and his team were going for with Star Wars. Even the most pedantic Star Wars fan may not have noticed how Vader’s costume changed from film to film. The helmet design in The Empire Strikes Back eliminates the red eyes and more sinister looking brow with a pronounced widows peak and adds a more detailed chest box. Also, the costume in Empire displays Vader’s shoulder pads—covered up by robes in the original—in order to give him a more robotic appearance. Vader is certainly glossier by Return Of The Jedi but mostly retains the look of Empire’s design. The helmet received a redesign especially for the unmasking scene at the film’s climax. When Vader returned to the screen for the first time since 1983 in Revenge Of The Sith, a completely new helmet was constructed. The helmet seen in Sith marked the use of a perfectly symmetrical Darth Vader mask, subtlety giving the villain a more robotic look. Michael Kaminski’s book, The Secret History Of Star Wars, can be purchased on Amazon.